Occasionally snake owners encounter feeding problems with their pet snakes. Some snakes, like ball pythons, are known to not want to eat but feeding problems can occur with any kind of snake. Make sure the frozen mouse (or other pre-killed prey item) is warmed up until it is at least room temperature. Thaw frozen prey in a bag in the refrigerator or by floating it in cold water and then placing it in warm water just before feeding it to your snake to warm it up. Never use the microwave to thaw frozen prey. Burns to your snake may result due to uneven heating of the prey or your prey may explode in the microwave during the process of heating and no one wants to clean that up. Use feeding forceps and not your hand to present the thawed and warmed prey to your snake. The forceps will help keep your snake from associating your hand with food. The forceps will also allow you to wiggle the prey item to mimic live motion which often elicits a strike from the snake. Dip the thawed prey in sodium-free chicken broth. The scent of chicken broth appeals to some snakes and may encourage them to strike. If you are attempting to feed your snake a new kind of food, rub the new prey item with another favorite food that your snake is familiar with. For example, if your snake likes chicks but won't take mice, rub a chick on a pre-killed mouse and then attempt to feed it to your snake. The familiar scent of a favorite food may trick the snake into taking the new item. Try a different color of the prey item if there are some available. If you have already tried a white mouse without success, try a multi-colored or dark-colored mouse since some snakes seem to balk at albino mice. Although it seems a little gross, the scent of brain matter is particularly effective at stimulating the feeding response in pet snakes. Therefore, exposing the prey's brain, or at the very least cutting the prey open to expose blood, may help in getting your snake to eat it. If your snake is reluctant to take mice or rats you can try gerbils. 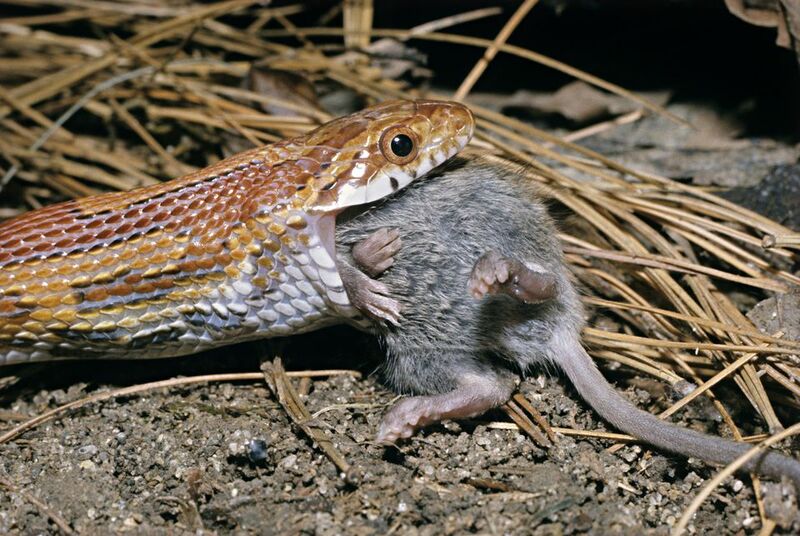 Although this can get expensive, some snakes that don't take pre-killed mice will happily take pre-killed gerbils. You can also try hamsters or other kinds of rodents as prey, provided you still stick to appropriately sized animals. Place your snake in a small enclosure that is used only during feeding time. This should be in a quiet place. Give your snake some privacy while it feeds. Feed your snake at night and cover the tank. You can also provide a dark hide box for your snake since some prefer to eat in a secluded spot. Try a different size of prey. Maybe your snake would prefer it's prey be slightly smaller or larger than what you are already offering. Pinkies and fuzzies are good small prey options. Make sure your snake isn't about to shed. If your snake's skin appears lighter or more dull than usual and its eyes are a milky blue than they may be about to shed. Most snakes that are about to, or actively, shedding will not eat. Check the temperatures in your snake's enclosure. If your snake is too cold it's metabolism will slow down and it may not eat. What Size Prey Should You Feed Your Snake?